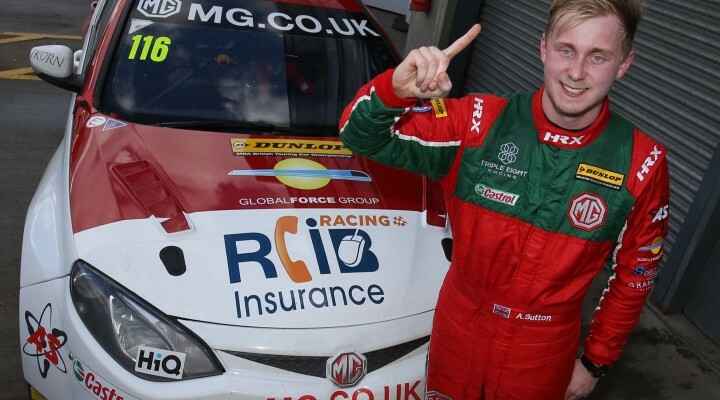 MG Racing RCIB Insurance scored a memorable one-two in qualifying for Round 4 of the 2016 Dunlop MSA British Touring Car Championship after sensational performances from young duo Ashley Sutton and Josh Cook at Donington Park. A breathless qualifying session in tricky conditions, which at one stage included sun on one side of the circuit and hail on the other, culminated in an enthralling finale as the 1.97-mile track eventually dried out. Provisional pole position changed hands more than ten times in the latter stages of running, which had commenced in damp and greasy conditions. With practically all cars utilising the Dunlop wet tyres for the first 25 minutes there were several improvements, but almost as many off-track incidents as competitors struggled to cope with the conditions. The BKR Volkswagen of Mark Howard was the first to go off and out of the session after just two minutes, whilst Jack Goff, Rob Austin and Matt Simpson all recovered from minor spins. Adding to the drama were issues for champion drivers Gordon Shedden and Andrew Jordan, as their respective machines failed ride-height checks. Both Halfords Yuasa Racing and Motorbase Performance corrected their cars in order for Shedden and Jordan to rejoin the fray, but the session would go from bad to worse for the latter. Jordan’s Pirtek-backed Ford eventually set a blistering pace and briefly moved to the top of the times with just six minutes to go, but pushing further on the following tour proved a step too far as his Focus slid off the circuit and into the gravel. The red flag was flown as sun scorched its way back through the clouds, and despite hail briefly making an appearance, when the action resumed, the track surface was ready for Dunlop SportMaxx dry tyres. This meant we were set for a final five-minute shoot-out for pole as times immediately tumbled at the restart. P1 changed hands almost every time a car crossed the line, before Mat Jackson incredibly followed his Motorbase Performance team-mate’s lead. Jackson crossed the line to top the times in his #7 Ford Focus, but then spun wildly out of contention on the very next lap. A gaggle of cars were still completing flying laps as Sutton took over at the top with his MG stablemate Cook slipping in behind, before the red flag came out with Jackson’s car languishing in a dangerous position. Ironically the stoppage also aided Jackson as he hung onto third behind the MGs, while reigning champion Shedden ended up fourth after hauling his ballast-laden Honda Civic Type R up the order. Tom Ingram backed up his pole position at Brands Hatch with a top five placing, ahead of Rob Collard’s Team JCT600 with GardX BMW. Aron Smith’s BKR VW was next in the order, whilst Jack Goff’s Team IHG Rewards Club BMW edged out Matt Neal’s Honda to take eighth. Jake Hill produced another impressive run as the young Team HARD-run racer completed the top ten. Colin Turkington was the first of the new Silverline Subaru BMR Racing entries, in 11th while his trio of fellow Levorg runners had to settle for 16th, 17th and 18th, with Warren Scott getting the better of both James Cole and Jason Plato. Tomorrow’s triple-header of races will be screened live and exclusively on ITV4 from 10:30am.